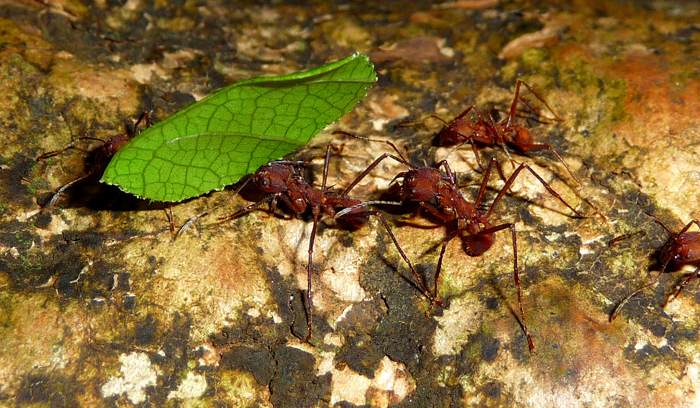 Leafcutter, aka Atta columbica, on their daily routine schlepping leaves to feed fungus farms in the underground colony. Had a nice day in the forest, drawing the root system of a cecropia tree, which resembles a wrestling match. 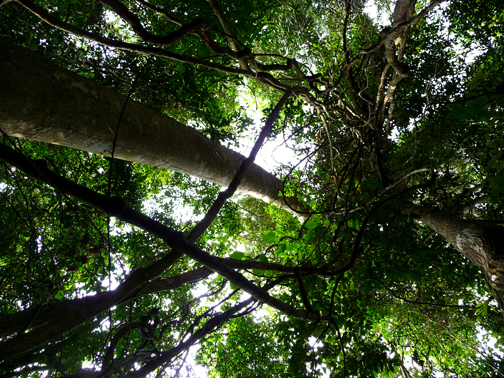 Very muscular and contorted intertwined limbs stretched out to attach to the ground and hold up the pipestem of the tree above. Very dramatic and handsome subject. While I was working a great tinamou strolled into the scene and froze when it saw me. Tinamous are about the size of a regulation football with a small head and chicken-like legs (although not in any way related). Usually you scare them off when you blunder down a trail, at which they heave their bodies into the air a couple of feet vertically and flap away laterally another dozen or two, leaving you with heart failure for a minute. If you are already there and being quiet as I was, the tinamou will play statues with you. That’s what this one did, less than ten feet away. I followed suit and looked to one side, a cunning strategy all humans can try on their own. After a few moments the tinamou calmed enough to put its tail down, which is when I drew it into my composition (who could resist such a nice model?) It held the pose for four minutes, long enough for me to rough it in, and then amazingly the tinamou nestled down and relaxed in the leaf litter. Where it stayed another twenty minutes or so, then it got up, fluffed out it’s beautiful gray and brown barred feathers and walked away. Later I checked the spot and saw no evidence of a nest. It liked my company? Do I just have that effect on birds? p.s. that drawing will be uploaded sometime soon- not ready for viewing at the moment, but I have plenty of other visuals here from the past two days or so. 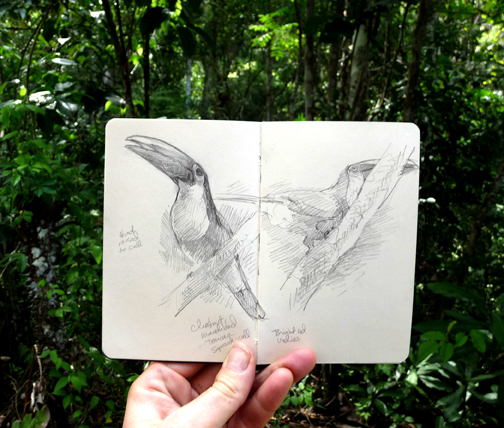 It’s a rich mine of visual treasures here on Barro Colorado Island! 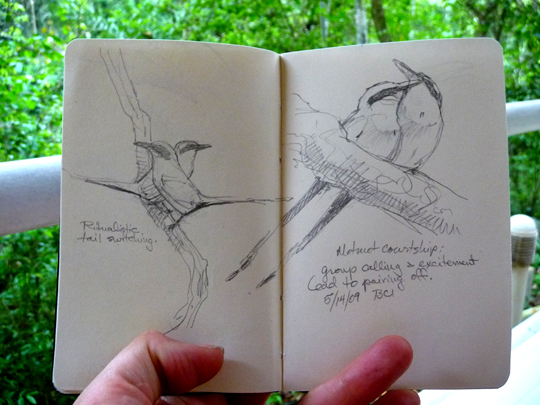 Drawing the motmots: rufous motmots court in the forest. Big, handsome and richly colored birds with wonderful mysterious voices. 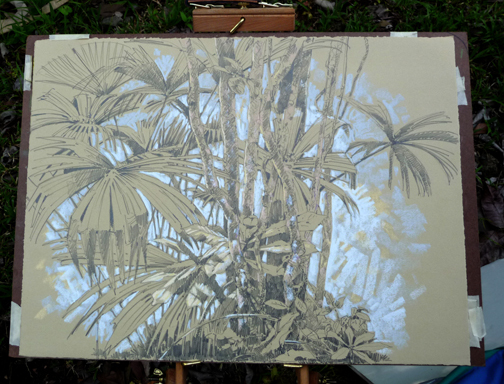 Yesterday's large plein air drawing: palms at the edge of the forest. The Jullian Watercolor field easel, by the way, works wonderfully well- highly recommended! This is graphite and pastel on 18"x24" Rives BFK. One of the toucan species on the island: chestnut-mandibled. Big and colorful, with a yellow bib and brilliant red and white drawers. Things are looking up from here! I LOVE palms at the edge of the forest! Nice sketches, I like the quality of the line in your drawings. Your location is a nice treat. I just posted some bird art of my own…here is my link: http://artistatexit0.wordpress.com/ I look forward to your future posts!! god I wish I could sketch. Love, love, love Atta ants. I literally passed hours at a nest in Ecuador watching. The mechanic of Evolution that produced them boggle my mind. How can you not know about their life history and not come away awed and amazed. I’m awed and impressed that you spent hours watching- you must be a secret myrmecologist! They are indeed a wonder of evolution. They are one of my favorite parts of the ecosystem in the tropics. A treat to watch, and when they pick up fallen flowers, there’s a parade of color on the forest floor. I love the little caste of ant that rides along the collected bit of leaf, to protect the larger worker from parasitic flies. How cool is that? holy moly, you don’t need me to tell you how stunning these are. but they’re stunning.